Last night Gord quietly passed away with his beloved children and family close by. Gord knew this day was coming – his response was to spend this precious time as he always had – making music, making memories and expressing deep gratitude to his family and friends for a life well lived, often sealing it with a kiss… on the lips. Gord said he had lived many lives. As a musician, he lived “the life” for over 30 years, lucky to do most of it with his high school buddies. At home, he worked just as tirelessly at being a good father, son, brother, husband, and friend. No one worked harder on every part of their life than Gord. No one. Perhaps the Hip’s biggest allure to fans was their connections with hockey, a sport that rarely gets significant recognition in the United States. Gord himself grew up playing goalie for the Amherstview, Ontario hockey team. He had connections to the game at its highest level with his godfather, Harry Sinden. Sinden became head coach and general manager of the Boston Bruins and won the Stanley Cup in 1970. With a background like that, it is no surprise hockey is mentioned throughout Gord’s poetic lyrics. Gord and the band had a place in the hearts of many Buffalonians due to the their love for hockey and the city’s proximity to the Canadian border. The Hip were frequent visitors to Western New York, most recently performing on April 18th, 2015 in what is now Keybank Center. That show featured the 1992 album, “Fully Completely” and would unfortunately be the group’s last visit to our great city. Gord recognized Buffalo’s appreciation for the Hip’s music. He is pictured below wearing a Sabres jersey during a show and he even gives us a shout out in the hit song, “At the Hundredth Meridian.” The Sabres used the song “Grace, Too” in a motivational video that was often played on the jumbo-tron during intermissions throughout last year’s season. Clearly, there is a significant bond between the Buffalo community and the famous Canadian rock group. Further exemplifying this bond is the mural located at 1673 Hertel Avenue which depicts Gord performing on the “Man Machine Poem” tour. The quote inscribed on the wall is, “No dress rehearsal, this is our life,” a line from the 1996 hit song, “Ahead by a Century.” Artist Rory Allen said he chose that line as it fully embodies Gord’s desire to live life to the fullest, even after his terminal diagnosis. Gord Downie was a man who recognized the good parts of life. He preached about the ups and downs we all experience, but saw that “It’s a Good Life if you Don’t Weaken,” and weaken he certainly did not during his final months. 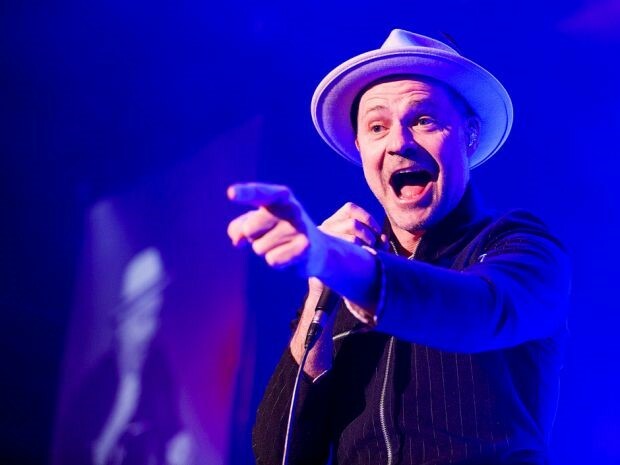 In this short period, The Hip released their 13th album, “Man Machine Poem,” and Gord himself was set to release a sixth solo album, “Introduce Yourself,” on October 27th. Clearly, he was not going to let cancer stop him from doing what he loved. Indeed, his “music is at work” as he tells us to embrace each day we are blessed with. His lyrics will live on in the hearts of all his fans for a long time to come, and to this I say, rest in peace. You will be missed, Gord.